Make the task of doing dishes a breeze with this Amana Tall Tub Dishwasher. Equipped with tall tub interior, this unit allows items which are too big for standard dishwasher tubs to fit easily. Its Triple Filter Wash System- a filter screen, coarse filter, and micro-fine filter cup- is designed to eliminate prewashing and rewashing from your daily routine and ensure clean dishes for the next meal. The antimicrobial component protection is built in during the manufacturing process, helping inhibit the growth of stain- and odor-causing bacteria on the silverware baskets. With an internal heater to remove excess moisture, this Amana Tall Tub Dishwasher makes it possible to let your dishes go straight to the cupboard without towel required. Tired of scrubbing? No worries, this tall tub dishwasher features a Heavy Wash Cycle which provides heavily soiled items with a longer, more thorough soaking to scour away grungy messes. And its Rinse Aid Dispenser automatically adds a measured amount during the wash cycle to reduce the potential for spots on your dishes, putting your mind at ease. You are allowed to wash whenever you want to thanks to the Delay Start Option. You can set the dishwasher to run, even if you’re off and running. Its SofSound I quiet package makes sure the dishwasher won’t interrupt your life. 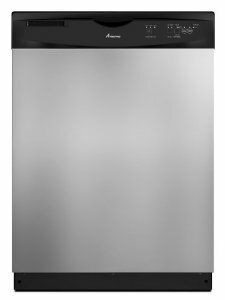 For added safety, this Amana Tall Tub Dishwasher features Control Lockout that locks the controls so little fingers can’t turn on the dishwasher.